Oh look another tree stamp! 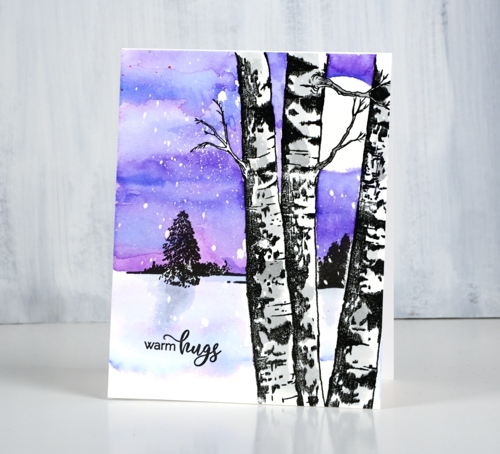 I created a wintry scene with the new ‘birches’ stamp and older ‘peaceful winter’ set from Penny Black. I began by stamping the birches stamp in black and embossing it in clear powder. I die cut a circle from frisket film to mask the moon and pressed it down firmly in the top right corner then splattered masking fluid over the panel. Frisket film and masking fluid (sometimes called liquid frisket) are used to mask areas when watercolouring; the film is plastic with an adhesive back and the fluid is gummy when it dries. You should be able to remove them easily after all your painting is dry. 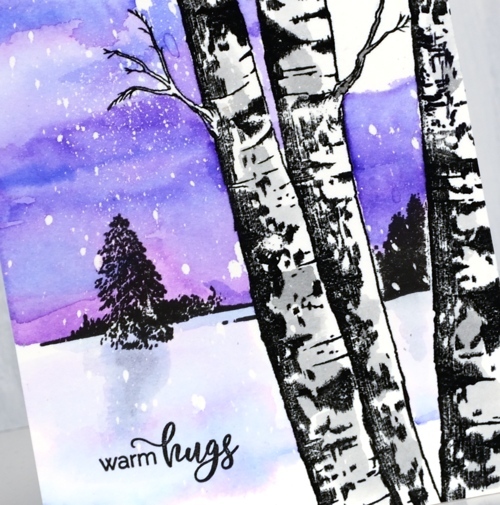 I placed some masking tape across the birch trunks then stamped the distant trees stamp from the ‘peaceful winter’ set in nocturne ink. The distant trees gave me a horizon line above which I painted my distress ink sky. I pressed both wilted violet and blueprint sketch inks onto my glass mat, added a little water and painted the sky. By letting the ink dry slightly between applications I was able to get some darker ‘dried’ lines in the sky. Once the sky dried I removed the moon mask. I decided to add some shadow to the birch trunks by painting diluted black soot ink here and there. I used the same colours but more diluted to add some shadow in the foreground snow. Once the ink dried I removed the masking fluid, added a sentiment from the ‘smile all season’ set and immediately thought of someone who would like this colour scheme. Very pretty. Always enjoy your cards. You do great work. I always love another tree scene, so serene. Thanks all the inspiration. Your cards are just the best! This is stunning! I so wish I lived close to you and you gave lessons, but since I don’t, I’ll just slobber all over your blog posts! You have great talent! Magnificent, Heather. 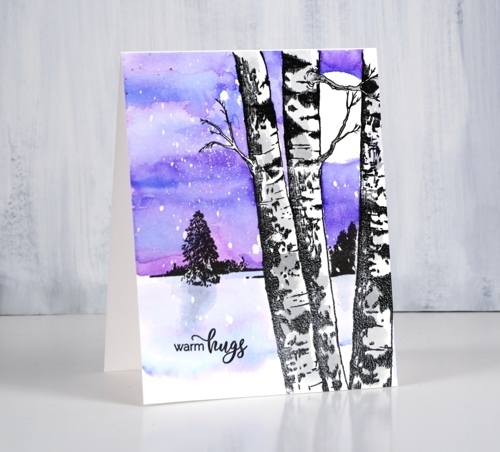 Just when I thought that I had all the tree stamps I needed, you showed us a new way to use the Birches stamp. The composition and colour are just so good, they were made for each other. Truly wonderful. Ooops, have I lengthened your wish list? I’m afraid when it comes to tree stamps I can’t be trusted! Hi, Heather, your work is absolutely breathtaking! I love to come over and take a look around when I need inspiration. The sky, the snow, the trees, the moon – thank you for the beauty! !